Most people in Ontario have a general sense that electricity is expensive and that heating homes or apartments with electric baseboards can lead to painfully high hydro bills. Fewer people are aware that technology can help; the same basic technology that people already use in their homes every day. Air-conditioners and refrigerators cool by absorbing heat energy from one space and rejecting it to another. 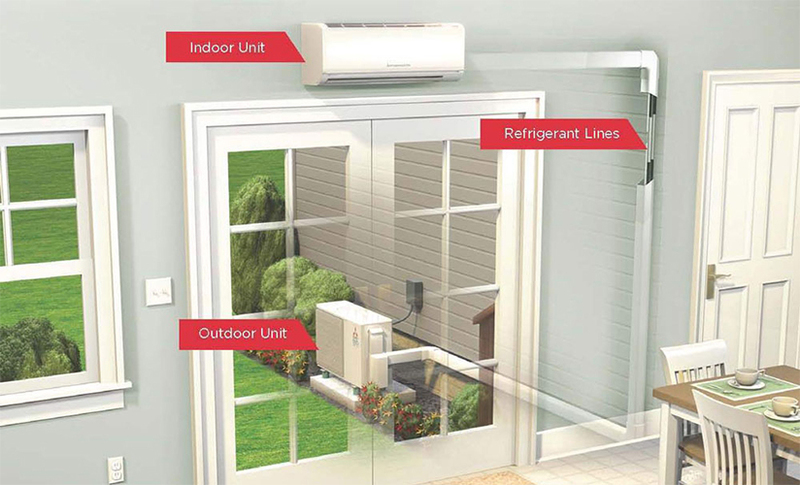 A heat pump uses this same principle to heat – it absorbs heat energy from the outdoors and rejects it indoors. The magic of a modern cold-climate air-source heat pump (ASHP) is that it can extract useful heat energy from extremely cold outside air and deliver it inside at comfortable temperatures. It still uses electricity, just a lot less than electric baseboards. An ASHP also provides high-efficiency cooling. In a recent project, the Sustainable Technologies Evaluation Program (STEP) partnered with The Atmospheric Fund (TAF), The Bloom Centre for Sustainability (with funding from the Province of Ontario), JAMA Property Management, Cricket Energy, and heat pump manufacturers Mitsubishi and Daikin, to evaluate the performance of ductless multi-split air-source heat pump retrofits in multi-unit residential buildings (MURBs) in a cold Canadian climate. 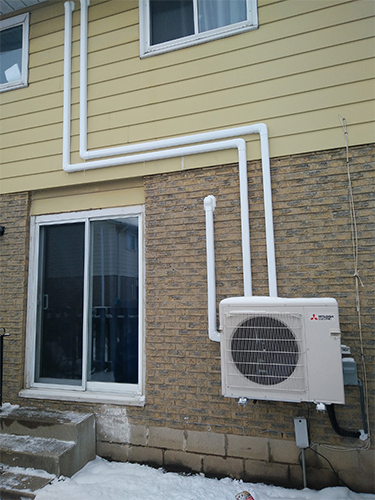 Outdoor coil and refrigerant line set for the Mitsubishi heat pump installed in a 3-bedroom rowhouse unit. The ongoing project in Brantford, ON saw four electrically-heated rowhouse units retrofitted with ductless ASHPs in November 2017. The ductless ASHPs, chosen for their ease of installation, were also outfitted with sensors to allow for monitoring by the STEP team. Throughout the winter of 2017/2018, the ASHPs continued to provide heat for the units even in extreme cold conditions. The data indicated that the heat pumps would reduce the total heating season electricity bills by 20 to 30% in a typical year. Combined with substantial electricity savings over window shakers during the cooling months, this was estimated to produce approximately $850 per year in savings for the rowhouse units over the estimated 15-year lifetime of the equipment. A series of interviews with the tenants over the course of the study found very positive feedback. Tenants appreciated the lower bills, simplicity of the retrofit process, quiet operation, improved thermal comfort, easy controls, and the addition of a whole-house cooling system. There are a variety of heat pump technologies available, covering the entire range of potential applications in buildings. The choice of any particular heat pump technology for a retrofit is a balancing act between annual operational savings, up-front cost and the thermal comfort of the occupants. However, regardless of the application, the thing to remember is that if a building is currently heating with electric baseboards – heat pumps can help to reduce electricity consumption, carbon emissions, and overall operating costs.